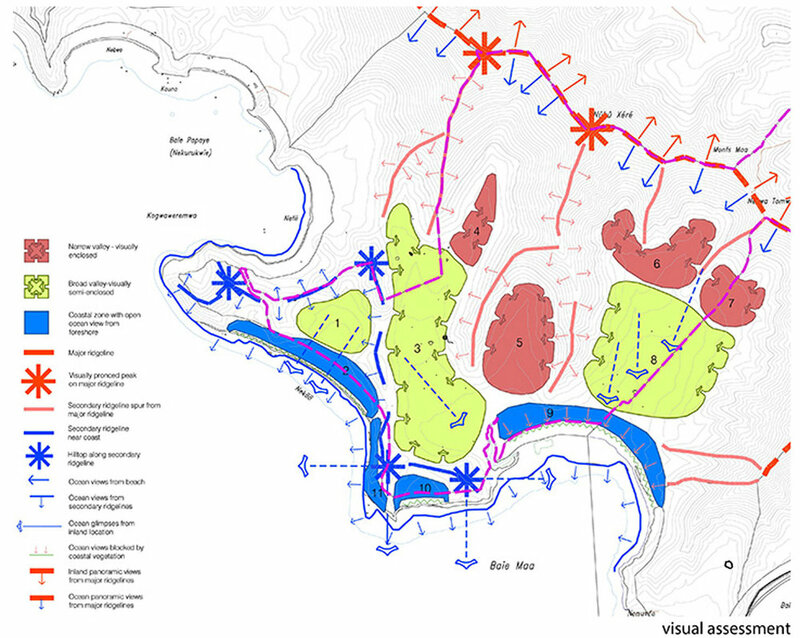 Corkery Consulting was engaged by Dickson Rothschild to provide specialist site analysis and landscape planning skills as part of the Baie De Nekoo Master Plan project team that prepared a Master Plan for a coastal site north of Noumea in New Caledonia. The 365 hectare site is located in a spectacular landscape that extends from sandy beaches and headlands inland to broad valleys and up steep slopes to a major ridgeline. Panoramic views from the site extend along the coast and out to sea. Corkery Consulting was responsible for preparation of the site analysis that provided the basis for determination of the most appropriate pattern of development and land use throughout the site. Preparation of the Master Plan involved identification of three different land use scenarios that were evaluated by the project team in consultation with the client to identify the preferred scenario. The Master Plan provides for an integrated residential resort development that responds to the natural features of the site to ensure they are protected and form an integral part of the landscape character. The Baie De Nekoo project is located on a coastal site north of Noumea in New Caledonia and covers some 365 hectares. The site sits in a spectacular landscape that incorporates sandy beaches and headlands, broad grass covered valleys with clumps of remnant trees and forest-covered steep slopes of visually prominent set of hills. Panoramic views from the site extend along the coast and out to sea. Corkery Consulting was engaged by Dickson Rothschild to provide specialist landscape analysis and site planning skills to the project team. The scope of involvement included preparation of the site analysis that included landform, drainage, vegetation and visual assessment. Results of the site analysis provided the basis for identification of the development potential of the site. Preparation of the Master Plan involved the identification of three land use scenarios that were evaluated by the project team in consultation with the client. The final Master Plan provides for an integrated residential resort development that responds to the natural features of the site to ensure they are protected and form an integral part of the landscape setting for the development.